Save all the mining kittens in Easy Mode. Save all the mining kittens in Normal Mode. 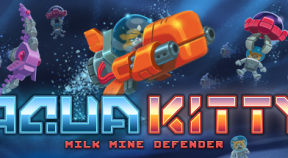 Save all the mining kittens in Arcade Mode. Complete level 11 without turning in Normal Mode. Reach wave 10 of Infinite Espresso in Easy Mode. Reach wave 15 of Infinite Espresso in Easy Mode. Reach wave 20 of Infinite Espresso in Easy Mode. Reach wave 30 of Infinite Espresso in Easy Mode. Complete all levels in Easy Mode. Complete all levels in Normal Mode. Complete all levels in Arcade Mode. Beat the Boss on Easy Mode in under 3 minutes. Beat the Boss on Normal Mode in under 3 minutes. Beat the Boss on Arcade Mode in under 3 minutes. Have all three directional pickups active at once. Player 1 max out all shop items in Arcade Mode. Chain 3 bombs in under 2 seconds. Lose too many of those cute milk miners. Rescue 100 miners from being abducted. Go crazy and destroy 20 enemies in an exceedingly short period of time. Reach wave 10 of Infinite Espresso in Normal Mode. Reach wave 15 of Infinite Espresso in Normal Mode. Reach wave 20 of Infinite Espresso in Normal Mode. Reach wave 30 of Infinite Espresso in Normal Mode. Reach a maximum chain bonus of 99. Player 1 max out the health bar with all 5 hearts in Infinite Espresso in Normal Mode.